Saint Quentin was a Roman, descended from a senatorial family. Full of zeal for the kingdom of Jesus Christ, he left his country and went into Gaul, accompanied by eleven other apostles sent from Rome. They separated to extend their campaign of evangelization to the various regions of France. Saint Quentin remained at Amiens and endeavored by his prayers and labors to make that region part of Our Lord's inheritance. By the force of his words and works he preluded the glory of his martyrdom. He gave sight to the blind, vigor to paralytics, hearing to the deaf, and agility to the infirm, in the name of Our Lord, simply by the sign of the Cross. At all hours of the day he invoked his God in fervent supplications. But this apostolate could not escape the notice of Rictiovarus, the Roman prosecutor who at that time represented Maximian Herculeus in Gaul. 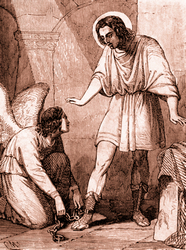 Saint Quentin was seized at Amiens, thrown into prison, and loaded with chains. Rictiovarus asked him: How does it happen that you, of such high nobility and the son of so distinguished a father, have given yourself up to so superstitious a religion, a folly, and that you adore an unfortunate man crucified by other men? Saint Quentin replied: It is sovereign nobility to adore the Creator of heaven and earth, and to obey willingly His divine commandments. What you call folly is supreme wisdom. What is there that is wiser than to recognize the unique true God, and to reject with disdain the counterfeits, which are mute, false and deceiving? When the holy preacher was found to be invulnerable to either promises or threats, the prosecutor condemned him to the most barbarous torture. He was stretched on the rack and flogged. He prayed for strength, for the honor and glory of the name of God, forever blessed. He was returned to the prison when the executioners who were striking him fell over backwards, and told Rictiovarus they were unable to stand up, and could scarcely speak. An Angel released the prisoner during the night, telling him to go and preach in the city, and that the persecutor would soon fall before the justice of God. His sermon, a commented paraphrase of the Apostles' Creed, has been conserved. To his profession of faith in the Holy Trinity, he added that Our Lord Jesus Christ, whom he adored, gave sight to the blind, hearing to the deaf, health to the sick and even life to the dead. At His voice, the lame leaped up and ran, paralytics walked, and water was changed into wine... He has promised to be forever with those who hope in Him, and He never abandons those who place their hope in Him; by His omnipotence He delivers them, whenever it pleases Him, from all their tribulations. His guardians discovered that he had disappeared, though all doors were barred, and found him in the city preaching. They were converted by the prodigy. But Rictiovarus was furious and said to them: You, too, have become magicians? Brought back before the tribunal as a sorcerer, Saint Quentin said: If by persevering in my faith, I am put to death by you, I will not cease to live in Jesus Christ; this is my hope, I maintain it with confidence. He was again placed on the rack and beaten, and tortured with other demoniacal means; his flesh pierced with two iron wires from the shoulders to the thighs, and iron nails were thrust into his fingers, his skull and body. Finally, this glorious martyr was decapitated, after praying and saying: O Lord Jesus, God of God, Light of Light..., for love of whom I have given up my body to all the torments... ah! I implore Thee, in Thy holy mercy, receive my spirit and soul, which I offer Thee with all the ardor of my desires. Do not abandon me, O most kind King, most clement King, who livest and reignest with the Father, in the unity of the Holy Spirit, forever and ever! His death occurred on October 31, 287. His body was twice buried secretly, and twice it was rediscovered miraculously  in the years 338 and 641, first by Saint Eusebie of Rome, on a marshy island, where it had remained intact; later near the city of Augusta, by Saint Eloi. Saint Quentin remains in great honor in France above all, where more than fifty-two churches and as many localities were, at the beginning of the 20th century, dedicated to his memory; he is honored also in Belgium and in Italy. Charlemagne and the kings of France have gone to venerate the relics of Saint Quentin.